A dramatic S.O.S. sign has been carved out of a stand of oil palms on a former plantation in Sumatra, serving to highlight the destruction of Indonesia’s rainforests. The work is part of a campaign by a Lithuanian artist, a conservation group and a cosmetics firm to raise awareness about palm oil-driven deforestation in Indonesia, the world’s biggest producer of the commodity. Extensive deforestation has for decades threatened the lives of the island’s native wildlife and the people who depend on the forests for a living. JAKARTA — An artist working with environmental activists has carved out a distress call from a stand of thousands of oil palm trees in a former plantation on the edge of a protected area in Sumatra, Indonesia, to highlight the destruction of the country’s rainforests. 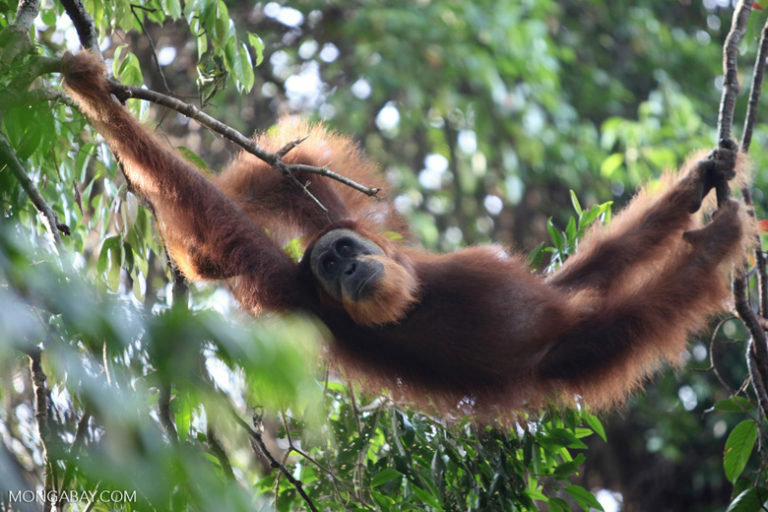 The letters “S.O.S.” stretch half a kilometer (1,600 feet) in a 100-hectare (250-acre) plot in Bukit Mas, North Sumatra province, near the Leuser ecosystem — the last place on Earth where orangutans, rhinos, tigers and elephants coexist. The work is in collaboration with the U.K.-based conservation group Sumatran Orangutan Society (SOS) and the cosmetics company Lush, which together raised funds to buy the one-time plantation through the sale of 14,600 orangutan-shaped soap bars last year. The goal was to completely reforest the land, which is now owned by SOS’s Indonesian sister organization, the Orangutan Information Centre (OIC), with native tree seedlings, and eventually link up the area with a nearby OIC reforestation site. Before clearing the oil palms and reforesting, though, the group recruited Zacharevic to put out the distress call to the rest of the world. “Ernest shared a really bold, creative idea with us at the time, and it just so happened that the land we had just bought was the perfect canvas,” SOS said on its website. For about a week, the multidisciplinary artist worked on the land, plotting his concept and eventually cutting down 1,100 oil palms to etch out the message. This installation is part of Zacharevic’s artistic awareness campaign called “Splash and Burn,” which he started two years ago. The title is a play on the slash-and-burn practices commonly used by plantation operators and Indonesian farmers to clear swaths of rainforest for monoculture farming. 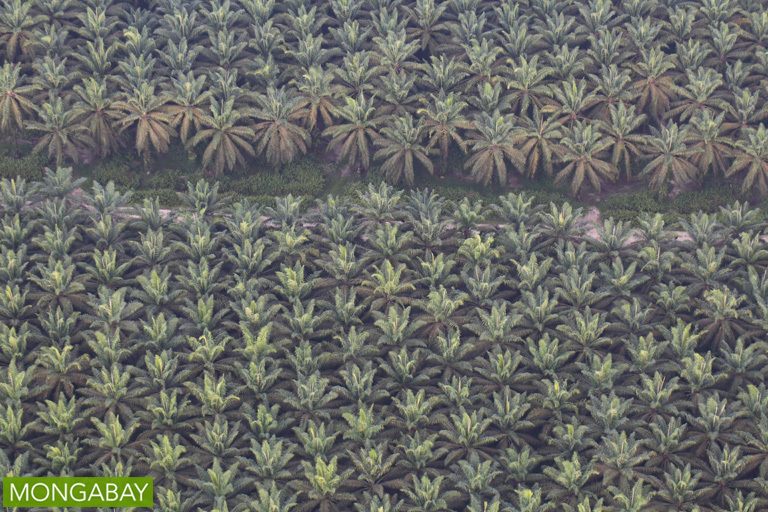 An oil palm plantation on Indonesia’s main western island of Sumatra. 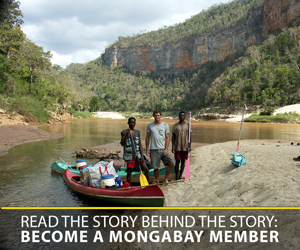 Photo by Rhett A. Butler/Mongabay. Indonesia is the world’s biggest producer of palm oil, a ubiquitous vegetable oil found in products from toothpaste and coffee creamer, to cookies and biofuels. But the rapid and unsustainable expansion of the industry has taken a massive toll on Indonesia’s rainforests and the countless people and wildlife that depend on them. In 2015, the country witnessed devastating fires, mostly on or near palm oil leases, that razed huge swaths of land and generated some of the worst haze on record. Smoke from the fires sickened half a million Indonesians, per government estimates, and drifted into neighboring countries. At the height of the disaster, the daily emissions of carbon dioxide as a result of the burning exceeded those from all U.S. economic activity. She said she expected to see orangutans and many other species roaming in the new young forest within a couple of years. Habitat loss due to rampant deforestation and hunting have pushed the population of the critically endangered Sumatran orangutan (Pongo abelii) to the brink of extinction. Banner image: The distress call carved into a Sumatran oil palm plantation that has been bought up to be reforested. Photo courtesy of Ernest Zacharevic.